As heavy plant, machinery and other items of abnormal cargo become more sophisticated, the need to offer a one-stop service to customers becomes more relevant than ever before. At SLS we understand that every out-of-gauge cargo movement presents its own unique challenges, and our expert knowledge and attention to detail ensures that the most secure, effective and economic movement is achieved. Our highly experienced team is always on hand to offer clients help and advice in order to achieve the effective movement of heavy haulage in the UK, Europe and worldwide. Over the years the movement of Project Cargo has become evermore complex. SLS have over 85 years’ experience in the movement of all types of Project Cargo and, from our offices in Silsoe, Bedfordshire, utilising a network of trusted partners worldwide, are able to supervise even the largest projects. SLS offers full project management solutions from initial planning and transit, through to completion, irrespective of project scale. We provide teams of skilled and experienced engineers with fully equipped vehicles that are able to handle complex equipment installation or extraction tasks, both in the UK and worldwide. SLS aim to provide clients with the most suitable solution tailored to their time scales and budgets. We support major manufactures throughout Europe with single and multiple trailer movements and are able to arrange Sea & Air Freight movements of cargo around the world. At SLS we are able to provide bespoke packing solutions for our clients. We design and manufacture anything from a simple pallet or basic transport case, to a bespoke packing solution using the latest high-quality materials to ensure maximum protection for your cargo during its journey. 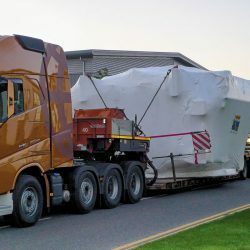 From organising a single shipment of heavy freight or co-ordinating multiple project cargo deliveries from a range of locations across the globe, to sourcing secure warehousing or developing a robust packaging solution for valuable cargo, SLS can solve any challenges you face relating to the movement of large or heavy items across the world.